VATICAN CITY (CNS) — Usury is a grave sin that must be fought by building more just and humane economic and financial systems as well as by teaching people to live within their means, Pope Francis said. The practice of usury — lending money at exorbitantly high interest rates — “humiliates and kills” just like a snake by “strangling its victims,” the pope told members of an Italian association dedicated to fighting usury and loan sharking. “It is necessary to prevent it, saving people from the illness of debt incurred for subsistence or for saving one’s business,” he told the delegation at the Vatican Feb. 3. But prevention also should include teaching people to live a more frugal lifestyle, he said. People need to be able to tell the difference between what is “superfluous” and what is absolutely necessary, he said, while learning to never take on debt for things that one could live without. “It’s important to recover the virtue of poverty and sacrifice: poverty, to avoid becoming a slave to things, and sacrifice, because one cannot receive everything in life,” he said. The pope praised the association’s work in saving more than 25,000 families in Italy from loan sharks, thereby helping them save their homes or small businesses and recover their human dignity. At the root of every economic and financial crisis, he said, lies a worldview that puts profits, and not people, first. “Human dignity, ethics, solidarity and the common good must be the focus of economic policies,” he said. “Usury is a grave sin; it kills life, tramples people’s dignity and is a vehicle for corruption and impedes the common good,” he added. 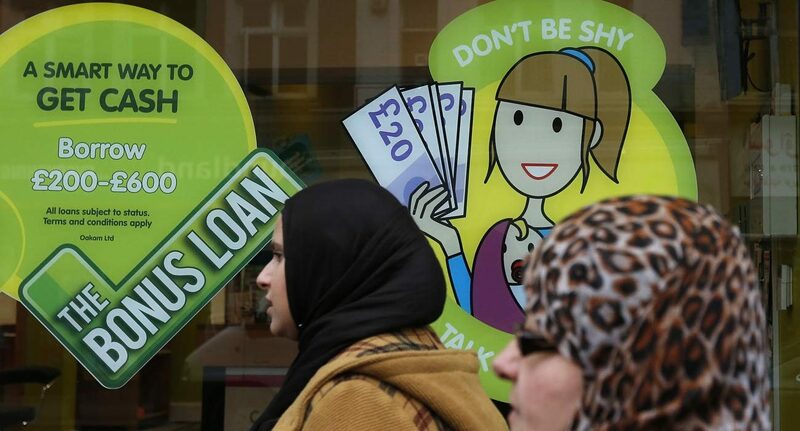 According to studies on payday lending in the United States by the Pew Charitable Trusts, 58 percent of those who turn to payday lenders have persistent difficulties in paying their monthly expenses rather than find themselves facing an unexpected temporary emergency. Severe financial desperation drives 37 percent of borrowers to accept whatever terms are offered while the majority of borrowers — 78 percent — are unaware of the huge cumulative costs and time required to pay back such loans, which often results in repeated borrowing, the Pew studies said. An average payday loan carries an annual percentage rate of 300 to 500 percent and is due in a lump sum on the borrower’s next payday, according to the Pew Charitable Trusts. Approximately 12 million Americans use payday loans annually, spending an average of $520 in fees to repeatedly borrow $375, it said in a 2015 report.